Analyze your site’s speed and make it faster. ⚠⚠⚠ Taking things down for roughly an hour to push out an update at 4:30PM PST - Apologies for any inconvenience! 394,038,795 pages analyzed so far. Join thousands of people and companies around the world committed to making the web consistently fast. 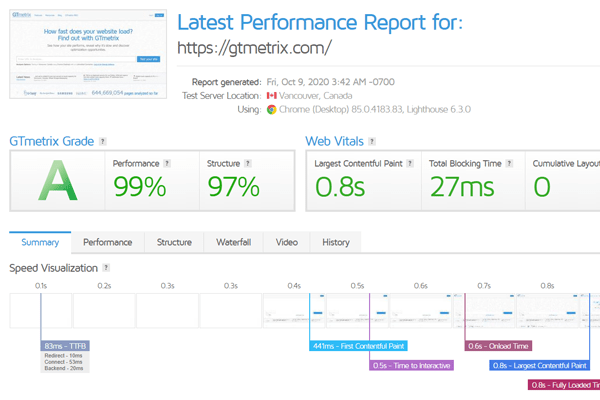 GTmetrix tells you a lot about your website performance. Our Report gives you the full picture on how your site loads and helps you detect where bottlenecks are. Get more insight on the inner workings of your site. Additional features give you details and data beyond an initial glance. Schedule GTmetrix to test your pages daily, weekly or monthly to ensure your site stays optimized. Hourly monitoring available to select GTmetrix PRO plans. Get alerts if your page triggers a certain condition! Set numerous conditions based on PageSpeed/YSlow score, Page load time, Total Page size, etc, and get an e-mail notification whenever any are triggered. Analyze the loading of your site from different regions around the world to see how users in the area would see it. 28 servers in 7 different areas globally gives you a wide geographic reach for analyzing your sites. See your page performance on an actual Android phone (only available at our Vancouver region; monitoring & API access not available)! GTmetrix visits your page through an Android phone to get real world performance data on your page load. Record a video of your page loading and pinpoint exactly where bottlenecks occur! Slow your playback up to 4 times the original speed, jump to major page load milestones, and get a filmstrip view that gives you a different visualization of your page load. Simulate your page load on various devices (phones/tablets) or screen resolutions, create presets for frequently used options, and more! Our Developer Toolkit gives you more advanced tools to get even greater insight on your page performance. Learn more. Take advantage of all of the powerful tools GTmetrix has to offer. Analyze your site now and see how well it performs! Take advantage of all the features GTmetrix has to offer and make your site the fastest it can be! Need to use GTmetrix in a professional capacity? Check out GTmetrix PRO!